Jahren ab dem Tag der Ausstellung. by the Prudential Regulation Authority with pre-approved number 102616.
be release accordingly in quarterly installment payments bases. One Hundred Million Euro Only the payment transfer will now be effect from our bank soon. and the Prudential Regulation Authority (Financial Services Register No. T 22702). Registered in England. Registered number Is 1026167 with registered office at 1 Churchill Place. London E14 5HP. I apologize for sending this late as I had to step out of office all day for an urgent personal matter. Due to the currency exchange it has to past through The Clearing House Automated Payment System (“CHAPS”) is the U.K.'s interbank gross settlement (“RTGS”) IT infrastructure of the Bank of England (“BoE”) The central Bank of England are not working today i could have check. Within Three banking working days you will received your funds transfer in your bank account also its depend on your receiving bank central bank in Turkey hopefully by Monday latest Tuesday Morning before Midday you must received alert in your local bank. Any person receiving this email and any attachment(s) contained, shall treat the information as confidential and not misuse, copy, disclose, distribute or retain the information in any way that amounts to a breach of confidentiality. If you are not the intended recipient, please delete all copies of this email from your computer system. As the integrity of this message cannot be guaranteed, neither BARCLAY'S nor any entity in the BARCLAY'S BANK shall be responsible for the contents. Any opinion in this email may not necessarily represent the opinion of BARCLAY'S or any entity in the BARCLAY'S BANK PLC. Thanks for your email, Normally swift transfer takes 3 to 4 days but we have contacted our bank we were told that the funds has left Barclay's bank via Central Bank of England currency exchange department before the funds will move to your Bank . Let us hope by Monday the funds will arrive at your Bank because today is Saturday and not banking working day. 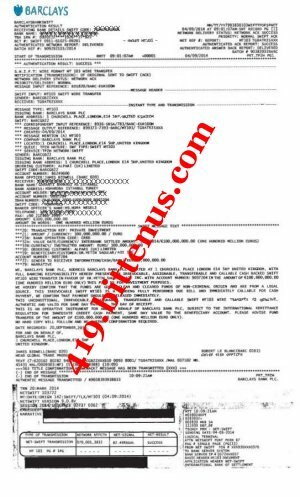 Enclosed is your attached outgoing Wire Transfer confirmation request copy with Swift MT103 Transmission Slip Copy Beneficiary in compliance with proper banking procedures. As soon as you confirm the receipt of your funds in your account please keep us inform. In respect of the result after the tracer from our remittance department discovered and finding the pending transfer of your funds still at Central Bank of England at currency exchange department but currently withheld under HM Revenue & Taxes custody for rectification of their local exigencies. We hereby inform you that we received Enclose attached file of IMMEDIATE STOP ORDER from HM Revenue (HMRC) & Customs UK's tax department authorities for settlement of the Tax code receipt. Enclose attached file received Immediate Stop Order from department of (HMRC) Revenue & Tax and outgoing fund transfer Policy revenue United Kingdom request for the Tax code receipt. The outgoing transfers will no longer reflect in your bank account as schedule today until the settlement of the demand Tax code receipt. Please contact Global Financial Services Company Tax consultant to submit the request Tax code receipt for onward release of the HOLD place on your outgoing transfer to your Garanti Bankasi AS Istanbul. To: Barclays Bank Plc UK. 1 Churchill Place, London E145HP. It has come to our notice through our intelligence-monitoring network have discovered that your office has effect the remittance of the above mentioned sum the transfer being process out of England and was carried out to designated bank via your correspondent bank. We therefore write to mandate that the remittance of €100,000,000.00(One Hundred Million Euro) in favour of ... be put-on-hold with immediate stop order and tax evasion effect in accordance with the Non-residential TAX CODE-IR20 being a Non UK resident Act as amended in Degree 7 section 148 Schedule (26) to, FA 2003 Tax Code-IR20 receipt. We hereby direct the Global Finance Ltd UK and Beneficiary of the said funds should present the original TAX CODE IR20 Bill Receipt by Global Finance Ltd Uk company Personal Tax Advisor for due clearance by ensuring the release of the aforementioned funds to Beneficiary designated bank account. The demand Tax code receipt should be channel to our office through the Global Finance Ltd Accredited Company Tax Consultant. Strict Adherence to this directive is mandatory. Thanks for your mail, we also received the message and information 2hours ago in our office. We have contacted our TAX CONSULTANT Mr.Charlie Morris which he promise to go to HM Revenue & Customs to hold a meeting with them in this regards. We are waiting for his outcome of the meeting with TAX Authority and we keep you update because we use our TAX CODE RECEIPT credit line of Global Financial Services (UK) Ltd to backup your funds transfer so we dont know why the HMRC office stop the payment let wait till our tax advisory come back we keep you update soon. After the receipt of your last message,I had to convene meeting today between my Organization and the HMRC Tax Revenue director, Mrs. Delphine Stanley HM Revenues Inspector of Taxes who signed the immediate stop order after several hours, we just finished the meeting about 25minutes ago and the mutual agreed final terms by all parties is that you would need to pay 0.2% plus VAT of the concessional tax fee payment amount which translates to €210,000.00.00 Two Hundred and Ten Thousand Euros with Value added Tax with Attached file of the Tax code payment invoice within the next Three days from today Monday before your total fund amount would be released to your bank account. Secondly,Intialy,we use Global Finance Ltd TAX CODE to backup your fund transfer but cannot guarantee such large hence the outgoing transfer beneficiary was not have company or residental permit in UK. HM Revenue & Customs dectected Global Financial Services (UK) Ltd through the data of the transfer submitted to them by the Bank of England as it was not the Global Financial Services (UK) Ltd made the out going wire transfer application form to our Barclays bank in the first instance the Bank of England discovered the irregularity in the tax during the exchange currency conversion and alerted the HM Revenue & Customs which is statutory regulation guarding amount of such large value,hereby making it impossible for Global Financial Services to use thier TAX CODE RECEIPT to cover this transfer,the sole beneficiary of the funds has to get his own TAX CODE. From the pressure from the Global Finance Director Mr. Williams James that I should do everything fast today and possible to reach an accord with the HM Revenues Inspector of Taxes for the release of the funds transfer to without further hindrances,it was the reason why I negotiated a short term arrangement with them to pay the €210,000.00 it is the law binding such funds that are on transit (TAX EVASION),so I have no option than to accept the condition for the payment concessional tax fee of €210,000.00 within the next three days because if I did not accept the condition your transfer funds would have back to Ministry of Fiannce for further investigation which may caused long delay. 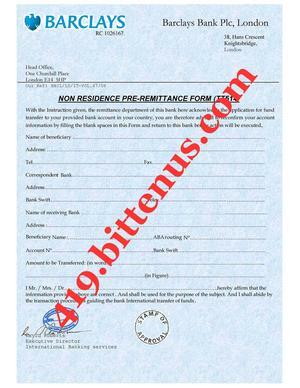 Further more, your fund transfer is on transit and does not have any immediate economic benefit to the UK government coupled with the irregularities noticed in the transfer process by beating the government Tax, in view of all these anomalies I had to do everything possible to get your funds quickly out of the UK to your Country. In view of this Tax scenario, it is virtually impossible for the government to release the fund transfer without payment of taxes, so, what you are to do urgently is to arrange for the payment of the assurance concessional tax fee and you should let me know in your reply the quickest possible time you would be able to make the payment. Sir, I would sincerely advise that you grab this opportunity and make arrangement to pay this concessional tax fee as brokering this situation was not easy but because of the reputation of my friends at the HMRC revenue had to accept this deal. Hope you understand that everything is been done in your favour. You should kindly ensure that you comply with this our last agreed terms so that we can move ahead and get the funds release successfully transferred into your bank account once and for all. NB: Attached file of the Tax code payment invoice WITH THE RECEIVING BANK DETAILS. While waiitng for the Tax fee payment slip from your bank. 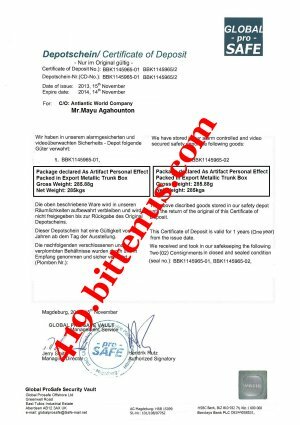 DECLARATION: We declare that this invoice shows the actual payment of the Service described And that all particulars are true and correct. Bank address: Acorn House, 1st Floor, 36-38 Park Royal Road, London, NW10 7JA. Henleaze Bristol Avon BS9 4NR. Don`t be a stupid man you talk like a big fool oh you want to received EUR 100.Million without paying TAX what a stupid man go to hel and born to axes for all I care remember that I have all your information including Passport I will submit thema ll to the authority & germany Embassy if you think you are wise. Just do anything stupit with my Linkedin & you will see where your name and passport will appear get lost if you cannot come up with a solution for both of us to pay this fees. I Mr. Mitsuhiro Mabuchi notifies you that I am withdrawing out and Termination my service to received the said funds of €800,000,000.00 Eight Hundred Million Euro on your behalf to my bank account in The transferring processing with Barclays Bank Plc UK. All the documents already issued on my name should be change to above new beneficiary I want to thank you for the consideration and courtesy given to me and this LETTER OF DISENGAGEMENT become valid with my below company signed & stamp. Stop that Ok, I have a friend based in the USA who has agreed to assist me with $100,000 so contact the Global Finance and ask for account and also contact him in the USA.